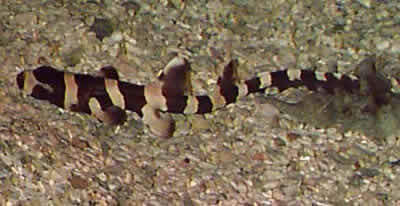 The Bamboo Shark is also called the Brown-spotted Cat Shark or Brown-banded Catshark. Juveniles like the one pictured here have the bands and occasionlly spots. The adult Bamboo Shark are often plain gray or brownish in color. This is one shark that is successfully kept, but needs a large aquarium for room to swim in and excellent filtration! These are among the smallest of sharks at about 40 inches. Adults of the Bamboo Shark, Brown-spotted Cat Shark, or Brown-banded Catshark can be kept reasonably well in a 150 gallon or larger aquarium. This video was incredible! It shows the birth of a Bamboo Shark, the juvenile stage then the adult coloration. What was very interesting is how the Bamboo Shark, while still in it's egg will react when a predator is near! The Bamboo Shark, while needing a large tank, is a great pet. Please do not think you can make this a freshwater fish, since this will slowly kill it over time. Let's keep are cool Bamboo Sharks alive and well, since we are the ones that bought it, we need to be the ones to care for it properly. The Bamboo Shark, Brown-spotted Cat Shark, or Brown-banded Catshark gets too large for most aquariums but is otherwise easy to keep. Feed all kinds of large meaty foods like small pieces of fish, squid, shrimp, and live goldfish. Best to feed small amounts several times a day. Bamboo Shark, Brown-spotted Cat Shark, or Brown-banded Catshark are found in the Indo-Pacific region, specifically, the east coast of the Indian Peninsula to northern Australia and north as far as Japan..
Gets along with other fish as long as they are large enough not to be thought of as food! The medial edges of the male's pelvic fins are modified to form claspers. The claspers are tubelike organs designed to deliver sperm into the female's reproductive tract. As the males grow older the claspers become more pronounced. The females do not have these. Egglayer, sometimes shark eggs are available for sale. More information on breeding can be found here: Banded Cat Shark. Bamboo Shark, Brown-spotted Cat Shark, or Brown-banded Catshark adults can grow to 104 cm ( 40 inches). A minimum 175 gallon aquarium is recommended. Usually found resting on the bottom. Great going, glad to hear your shark egg has hatched. Though its said they can hatch in around 6 weeks, there are reports of 6 months in some cases. I hope you can keep him going, the biggest problem is getting the new baby to eat. Once they reach about 7 inches, they are generally stable and they should grow about 9 inches a year. The flipping over on his back is concerning. I'm not a vet, but it sounds like it could be some kind of neurological disorders. Hopefully it will grow out of this, but you may want to talk to a fish vet or contact a public aquarium that has success with hatching out and rearing these sharks. Keep in mind that this animal will get very big. 36 inches is normal and it can get that big in about 4 years. A 300 gallon tank, with 500 gallons being optimal, will be needed for it to thrive. Thank you apreciate your reply :) I have been doing a lot a lot of research about him flipping on his back side. I'm going to try feeding him in a couple days since his (sack) has shrunk a bunch. Hopefully he will thrive I'm excited to get him a buddy and see where it goes. Well I'm excited for you and your baby shark! Keep us posted as he grows. Just a thought... if you register for our Pet Talk Facebook app when you add your comments, you can then upload some pictures for us to see too. Yes! This is normal when prematurely taken out the egg sac. But don't be too scared. You MUST keep turning the baby shark back over, using perfectly clean hands every single time. It's gonna take WEEKS! But as long as you keep turning it back over it will live. Which will be hard to keep up if your gonna for a big part of the day like work/school etc.. The shark will not eat anytime soon either. Just wondering were am I able to purchase one of these beautiful fish as I live in Australia?